Every year when Chanukah rolls around the excitement builds for a Jewish holiday that is traditionally celebrated with family. In Judaism, Chanukah is a holiday celebrating the re-dedication of the Second Temple of Jerusalem in 164 BC, after its desecration three years earlier by order of Antiochus the IV. The Maccabees recaptured Jerusalem and re-consecrated the Temple after leading a successful revolt against Syrian rule. The lighting of the menorah recalls the story that a one-day supply of oil burned miraculously in the Temple for eight days until new oil could be obtained. Sometimes called the Feast of Dedication or Festival of Lights, it is celebrated for eight days in December, during which time the ceremonial candles are lit and children play games and receive gifts. 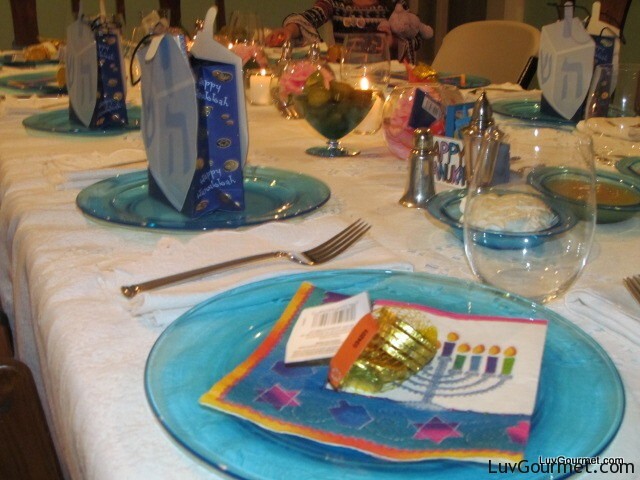 The Jewish holiday of Purim is the holiday when gifts are usually exchanged, but as a result of its proximity to Christmas Chanukah, originally a minor holiday has become more lavishly celebrated. A few weeks prior to Chanukah our family meets together to draw names for gifts for the annual Chanukah party. The party begins with the lighting of menorahs and a blessing. 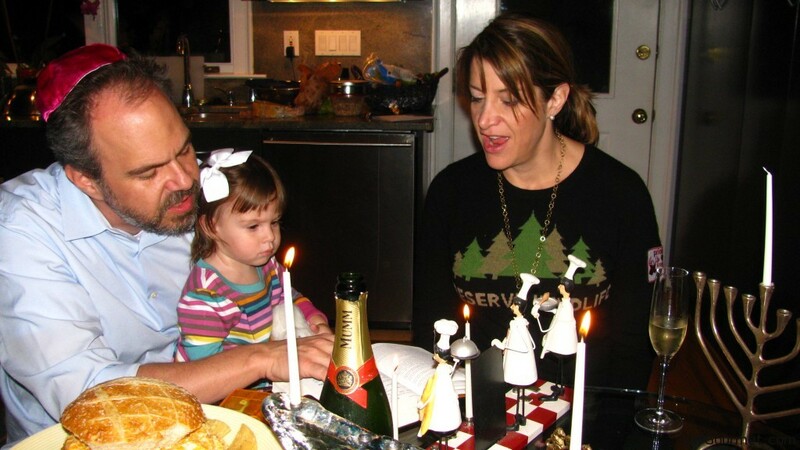 If multiple families are in attendance each family can light their own menorah. On the first night one candle is lit and, on each subsequent night of the holiday another candle is lit, until the holiday ends on the eighth day. Dinner is usually served next and fried foods are the star of the menu. Potato pancakes called latkes are served with sour cream and applesauce. At our house this year we served potato latkes and parsley latkes as well as zucchini latkes. We served bowls of sour cream, applesauce and cinnamon sugar to go with them and everyone was happy.Every family member brought a dish and the party was one of the best Chanukah’s ever. Right before everyone opened presents we served dessert. This year dessert was very special. 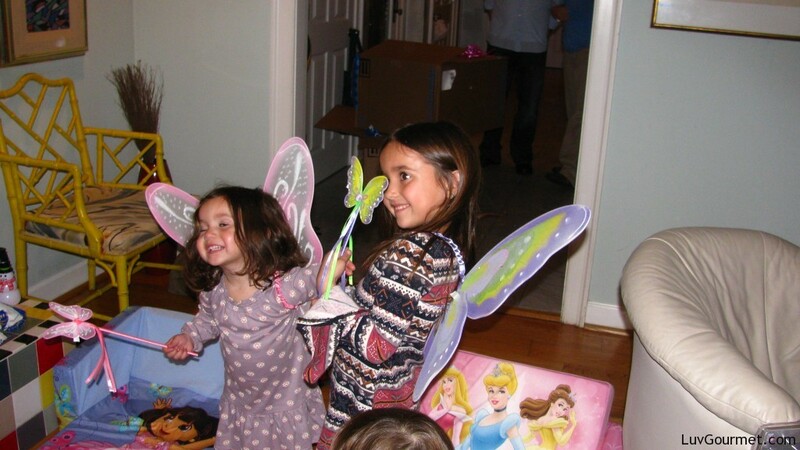 We brought the carnival to our house and made banana split funnel cakes…… and then the paper started flying, as the older grandchildren started passing out the gifts. We had a ball! It is not too late to try any of the following recipes: You won’t be disappointed. Potato pancakes are a great side with any meal and the funnel cakes were delicious and so much fun! Shred and place in a large bowl. Grate the onion and add all ingredients together with enough flour or matzo meal to bind the mixture together. Heat the vegetable over medium high heat. Place two tablespoons of mixture into the oil and pat down with a spoon to form a round pancake. Fry on both sides until golden brown and drain on paper towel. If you need to keep the latkes warm, place them in a warm oven while you finish making the rest of the mixture. Serve with sour cream, cinnamon sugar and/or applesauce. Whisk together the flour, baking powder and salt in a large bowl. Whisk together the milk, and eggs in a medium bowl. Make a well in the flour mixture, and then pour in the egg mixture and whisk until well combined. Let the mixture rest for 10 minutes. Heat 1 inch of oil in a medium straight-sided skillet to 375 degrees F.
Spoon 3/4 cup of the batter into a funnel with a 1/2-inch tip, keeping the opening at the bottom closed with your finger. Place the funnel over the skillet, release your finger and pour the batter through the funnel, moving to create a round, lacy funnel cake no bigger than 7 inches in diameter (or as big or small as you want! ), creating thick, even strands so the cake cooks evenly. Fry the cake until beginning to brown and crisp, 2 minutes, and then flip and cook until done, another 1 to 2 minutes. To serve, place 1 funnel cake on each plate and dust with powdered sugar. Top each with 2 scoops of ice cream, some strawberries and bananas and drizzle with chocolate sauce. Finish with the sweetened whipped cream and pecans. Happy Chanukah and Happy Holidays to all!